Copyrights: ©2015 Ghaly, Hammouda & Hattab. This is an openaccess article distributed under the terms of the Creative Commons Attribution License, which permits unrestricted use, distribution, and reproduction in any medium, provided the original author and source are credited. The drying behavior of strawberry as affected by the drying temperature and geometry of strawberry pieces and the quality of the dried products were investigated. Four geometries (whole, halve, quarter and eighth) and two temperatures (45 and 55°C) were evaluated. The initial moisture content of the fresh strawberry samples was 90.2%. Drying strawberry at the lower temperature (45°C) required longer drying time and the whole strawberry required the longest drying time followed by the ½. ¼ and 1/8, respectively. Increasing the total surface area to the weight ratio and the cut area resulted in a faster decline in the moisture content over time. The average drying rate was 0.26, 0.16, 0.11 and 0.09 g moisture/h and 0.31, 0.23, 0.16 and 0.12 g moisture/h for the whole, half, quarter and eighth pieces at the temperatures of 45oC and 55oC, respectively. The specific drying rate on weight basis was 0.016, 0.021, 0.029 and 0.042 g moisture/ g dry matter.h and 0.019, 0.030, 0.039 and 0.053 g moisture/ g dry matter. h for the whole, half, quarter and eighth at the temperatures of 45oC and 55oC, respectively. The specific drying rate on surface area basis was 0.018, 0.019, 0.020 and 0.023 g moisture/ cm2.h and 0.022, 0.026, 0.029 and 0.033 g moisture/ cm2. h for the whole, half, quarter and eighth at the temperatures of 45oC and 55oC, respectively.The critical drying time (time to reach 15% moisture content) was 22.1, 34.0, 45.2 and 56.2 h and 15.5, 24.0, 31.8 and 48.5 h for the whole, half, quarter and eighth strawberry pieces at the temperature of 45 and 55oC, respectively. The specific drying time was 3.40, 5.55, 8.11 and 10.34 h/g strawberry and 2.94, 3.91, 5.77 and 7.25 h/g strawberry for the whole, half, quarter and eighth at the 45 and 55 oC, respectively. From the economic point of view it is more efficient to dray whole strawberry at the higher temperature (55 oC). The lightness of the dried strawberry samples was lower than that of fresh samples. The redness of the dried strawberry samples was stronger (darker red color) than that of fresh samples as a result of increased concentration of the red pigments and the non-enzymatic browning reaction caused by the drying temperature. No significant differences were observed in the degree of yellowness between the fresh and dried strawberry samples. The total color change (∆E) decreased with increased temperature and increased with decreased sample size. The hardness value varied from 3.86 N to 6.02 N and from 4.42 N to 6.82 N for the samples dried at the temperatures of 45oC and 55oC, respectively. The lower the temperature and/or the larger the sample size the softer the dried strawberry. Shrinkage was evident in all dried strawberry samples and its extent was dependent on the temperature and sample size. It varied from 21.71% to 58.86% and from 44.57% to 63.77% for the samples dried at the temperatures of 45oC and 55oC, respectively. The rehydration value varied from 15.23% to 27.82% and was affected by both the drying temperature and the strawberry geometry. The higher the temperature and the larger the sample size the higher the rehydration value. Strawberry, Geometry, Drying, Temperature, Weight, Surface Area, Cut Area, Critical Time, Color, Hardness, Shrinkage, Rehydration. The total world production of strawberry in 2012 was 4.32 million metric tonnes. The United States is the world’s largest producer accounting for 30.4 % of the total world’s strawberry production followed by Turkey (7.0%), Spain (6.0%), Egypt (5.8%) and Mexico (5.3%) . As the fourth largest producer of strawberry in the world, Egypt produces the strawberry variety Fragaria vulgaris Ehthfor local and export markets. The fresh market of strawberries accounted for 80 % of total strawberry sale while frozen strawberry and juice, jam, concentrate and jelly products account for 20%. The strawberry cultivated area in Egypt in 2012 was 5833 ha, producing 242297 tonnes of strawberry of which 74967 tonnes (31%) were exported to 22 countries in Europe, Asia and Africa . Strawberry plantation represent the highest cash crop for the Egyptian farmers . Strawberry is a common and important fruit in the Mediterranean diet because of its high content of essential nutrients as shown in Tables 1-4 . Among the World's healthiest fruits, strawberry is the best fruit source of a pivotal antioxidant vitamin C and is ranked third (after raspberries and grapes) as a sources of manganese which is considered a key antioxidant mineral because of its key role as a cofactor for the antioxidant enzyme superoxide dismutase . Vitamins A and C in strawberry can mediate the effects of free radical damage in the body [6, 7]. The phenolic compounds in strawberry inhibit the oxidative processes caused by the reactive oxygen species [8, 9]. Many of the phytonutrients in strawberries function not only as antioxidants but also as anti-inflammatory nutrients working together in synergistic fashion to provide their cardiovascular benefits. Because of this unique combination of antioxidant and anti-inflammatory nutrients,strawberries have several health benefits(Table 5)including: cardiovascular support and prevention of cardiovascular diseases, heart and liver disease, neurodegenerative disease, arthritis, allergies, prevention of certain cancer types including breast, cervical, colon and esophageal cancer, cholesterol control and improved regulation of blood sugar by inhibiting the activity of the enzyme alpha-amylase that is responsible for breaking amylose starches into simple sugars, thereby decreasing the risk of type 2 diabetes [4,10-21]. Meyers et al. , Olsson et al. and Hannum  and reported that ddecreased oxidation of fats in the cell membranes of cells that line blood vesselsdecreased levels of circulating total cholesterol and LDL cholesterol, decreased the activity of angiotensin I-converting enzyme (an enzyme who’s over activity increases the risk of high blood pressure) and decreased risk of type 2 diabetes. Strawberries contain salicylic acid (an anti-inflammatory compound similar to the acetylsalicylic acid in aspirin) and have been shown to enhance cognitive and motor functions which was attributed to the ability of phytonutrients to lower the presence of pro-inflammatory messaging molecules like nuclear factor kappa- B . Strawberry is one of the most perishable fruits due to its highly delicate nature. Significant amounts of the fruits are lost during harvesting, handling, storage, packaging, processing, distribution, retail and consumption in addition to the weight loss caused by respiration and susceptibility to fungal contamination . The losses can be up to 20 % during harvesting, 3 % during post harvest handling, 12 % during distribution and 28 % during consumption . These losses can be minimized by drying some of the strawberry by processes such as freeze drying, osmotic drying, microwave drying, sun drying and air drying at low temperatures [25,26] The removal of moisture prevents the growth and reproduction of damaging microorganisms and minimizes many of the moisture-mediated chemical and enzymatic deterioration reactions. The reduction in weight and volume minimizes packaging, storage and transportation costs and enables storability of the product under ambient temperatures . The dried strawberry can be used as snack and in cereals or rehydrated and used with yogurt and in bakery products [28,29]. The aim of this study was to investigate the drying behavior of strawberries at low drying temperatures (45 and 55°C) using different sample geometries (whole, halves, quarters and eighths) and to evaluate the quality of the dried product. Strawberries were purchased from a local supermarket in Halifax, Nova Scotia. They were selected for uniformity in size and ripeness. The Strawberry fruits were washed and cut into different geometries (whole, halves, quarters and eighths). The average dimensions of strawberry are show in Figure 1. The initial weight, shape of strawberry was considered to be a cone on the top of a disc. 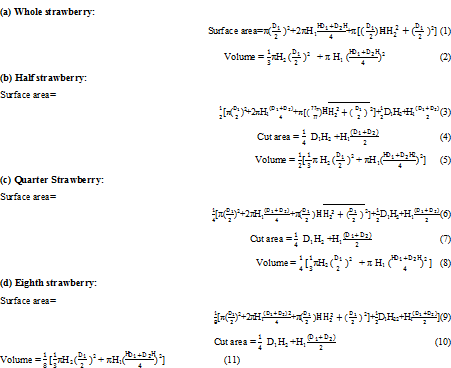 Equations 1-11 were usedto calculatethe volume, total surface area and cut area for the various strawberry geometries. The weight, moisture, dry matter, volume, surface area, surface area: weight ratio and surface area: volume ratio and cut area for the various geometries are presented in Table 6. Drying experiments were conducted at low temperatures (45 and 55°C) in order to maintain good color and texture of the dried fruit. The whole and pre-cut strawberry pieces (halves, quarters, eighths) were placed in pre-weighed drying dishes. The dishes containing strawberry samples were weighed and then placed ina forced-air oven (Isotope Oven 630F, Fisher Scientific, Ottawa, Ontario) at the desired temperature. The dishes containing strawberry were taken out of the oven at regular time intervals (every 4h) and weighed. The experiments were carried out with four replicates and the average value was determined. The hardness of dried strawberry samples was evaluated by a compression test using a Hardness Tester (Model 2 900-355 Digital Motorized Hardness Tester, Global Industrial Canada, Richmond Hill, Ontario). The dried strawberry sample was placed on a hollow base and the force was applied on the sample by a 2 mm probe at a velocity of 0.5 mm/s until the sample was cracked/penetrated. The test was carried out in four replicates and the average maximum compression force was recorded. The changes in moisture content with time for the various strawberry geometries at the two temperatures are shown in Figures 2 and 3. The kinetic parameters (critical time, specific critical time, drying rate coefficient, drying rate and specific drying rate) were calculated and are presented in Table 7. The initial moisture content for the fresh strawberry samples was 90.2%. The time required to reach a constant moisture content was affected by the drying temperature and the geometry of strawberry. Drying strawberry at the lower temperature (45°C) required longer drying time for all strawberry geometries.Krokida et al. reported that increasing the drying temperature accelerated the drying process of tomato and other vegetables and reduced the time required for drying. The results showed that the whole strawberry required the longest drying time at both temperatures followed by the ½. ¼ and 1/8 because the smaller strawberry pieces had the largest surface area per unit weight (0.83, 1.09, 1.29 and 1.75 for the whole, half, quarter and eighth, respectively). Increasing the surface area to the weight ratio resulted in a faster decline in the moisture content over time. Brooks et al. reported similar results while drying tomato of various geometries. 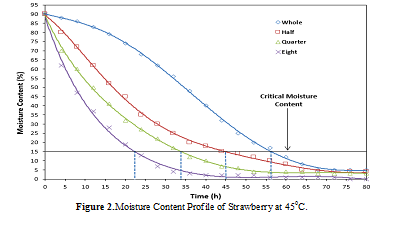 However, in this study, an initial equilibrium (first 25 h) was observed before the falling rate period in the moisture content profile of the whole strawberry. This was due to the intact surface (uncut skin) of the whole strawberry coming to equilibrium with the drying air. Similar results were reported by Zanoni et al. for tomato. The lack of equilibrium period with the cut strawberry pieces (half, quarter and eighth) may have been due to the faster movement of moisture through the cut surface of these samples compared to the intact skin of the whole strawberry. Increasing the percent of the cut area (0.0, 22.9, 37.2 and 54.2% for the whole, half, quarter and eighth, respectively) resulted in a faster decline in the moisture content at the beginning of the dying process. The critical drying time is defined in this study as the time required to reach a moisture content of 15% which is considered to be a safe moisture content for storage of dried products [31,33,34]. The critical drying time was 22.1, 34.0, 45.2 and 56.2 h and 15.5, 24.0, 31.8 and 48.5 h for the whole, half, quarter and eighth strawberry samples at the temperature of 45 and 55oC, respectively (Figure 4). Both the drying temperature and strawberry geometry affected the critical drying time. An increase in the drying temperature or a decrease in the sample size decreased the critical time. 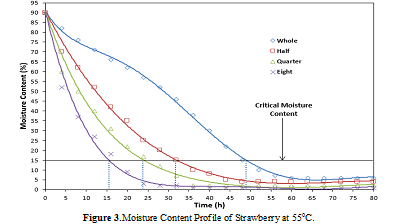 The critical drying time was plotted against the characteristic dimensions (weight, volume, surface area, surface area/weight, surface area/volume and cut area) of strawberry sample (Figure 5). The results showed that the critical drying time increase with increased sample weight (or volume) and decreased with increased surface area per unit weight (or unit volume) and increased cut area. Although the evaporation of water from the cut surface area would be faster than the un-cut surface area, the results indicated that the total surface area is more important than the cut area. Brooks et al. noted similar results when drying tomatoes of various geometry. The time required to dray one gram of fresh strawberry (90.2 % moisture content) to a constant weight was referred to as the specific drying time in this study and was calculated by dividing the drying time by the sample weight. The calculated specific drying time was 3.40, 5.55, 8.11 and 10.34 h/g strawberry and 2.94, 3.91, 5.77 and 7.25 min/g strawberry for the whole, half, quarter and eighth strawberry samples at the temperatures of 45 and 55 oC, respectively (Figure 6). Increasing the drying temperature or a decrease in the sample size increased the specific drying time. The results showed that from the economic point of view it is more efficient to dray whole strawberries at the higher temperature (55oC). The average drying rate was calculated by dividing the amount of moisture removed (when reaching the critical drying time) by the critical drying time. The values of the drying rate was 0.26, 0.16, 0.11 and 0.09 g moisture/h and 0.31, 0.23, 0.16 and 0.12 g moisture/h for the whole, half, quarter and eighth strawberry samples at the temperatures of 45oC and 55oC, respectively. Increasing the temperature and reducing the sample size accelerated the rate of drying. Brooks et al. and Pandey et al. reported similar trends for the drying rate of tomato. The specific drying rate was also calculated on the basis of dry matter ((g moisture removed per gram dry matter per hour) and surface area (g moisture removed per cm2 per hour) as shown in Table 7. 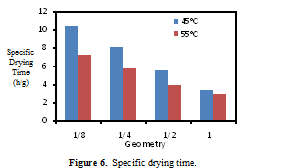 Increasing the temperature and/or the surface area increased the specific drying rate as shown in Figure 7. Brooks et al. calculated the specific drying rate on the basis of surface area and reported similar trends for tomato drying. Color is one of the most important food quality parameter. A change in the color of food produce may indicate the deterioration of its quality and affects its market value. The lightness of the dried strawberry sample was lower (decreased L* value) than that of fresh samples. The decrease in L* value was in the range of 12.81-14.76 and 10.55-11.79 for the samples dried at the temperatures of 45oC and 55oC, respectively. Similar results were reported by Shih et al. and Li and Ma  who stated that removal of moisture from agricultural products by during affects their color appearance. Singh et al. (2008) reported similar trend for L* while drying carrot cubes. The lower L* value observed with low temperature for the dried strawberry is due to the extent of drying time. Longer exposure to hot air caused darkening in the strawberry samples as reported by Shih et al. . The sample size also affected the lightness of the sample at both temperatures, the larger the sample size (whole) the higher the lightness of the strawberry sample. Brooks et al. noticed similar trends when drying tomato of similar geometries. It is known that a positive a*value represent redness of the product. The a*value was 33.97±0.02 for the fresh strawberry, in the range of 17.19-18.45 for the strawberry samples dried at the temperature of 45oC and in the range of 20.27-21.50 for the strawberry samples dried at the temperature of 55oC. The Results showed that the redness of the dried strawberry samples was stronger (darker red color) than that of the fresh samples. This phenomenon could be attributed to the effect of water removal and increased concentration of the red pigments anthocyanin and 3-glucosylcyanidin [38-40] and the non-enzymatic browning reaction accelerated by the drying temperature . However, the dried whole strawberry had lighter red color compared to the cut strawberry pieces and the samples dried at higher temperature had also lighter red color. The results showed no significant differences in a* values of the fresh and dried strawberry samples for all geometries at both temperatures. Shih et al. found no significant differences in a* values among the fresh samples and the hot air dried samples of strawberry. Baysal et al. found no significant differences in a* values among the fresh and microwave dried, infrared dried and freeze dried samples of carrot and garlic. Hardness is an important quality parameter for dried food products. It is related to the strength of the structure of the dried material under compression. Orikasa et al. stated that the hardiness of food products during drying is due to the concentration of sugar and the dimethyl ester reaction with pectin.Commonly, the softer the dried product the better its quality . The hardness value of the dried strawberry samples varied from 3.86 N to 6.02 N and from 4.42 N to 6.82 N for the samples dried at the temperatures of 45oC and 55oC, respectively (Figure 9). The results showed that the lower the temperature and/or the larger the sample size the softer the dried strawberry. The results also showed that hardness was proportional to the drying time. Chong et al. and Leeratanarak et al. reported that drying at lower temperature can cause starch gelatinization which can in turn cause softening of the structure resulting in less hardness value. 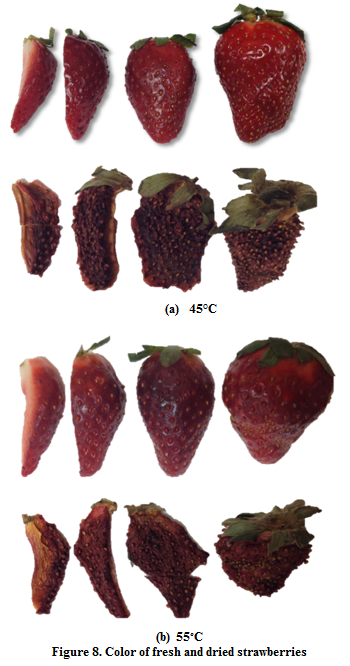 Shrinkage was evident in all dried strawberry samples and its extent was dependent on the temperature and sample geometry (Figure 10). The shrinkage in the strawberry samples varied from 21.71% to 58.86% and from 44.57% to 63.77% for the samples dried at the temperatures of 45oC and 55oC, respectively. The results showed that the strawberry samples dried at low temperature had lower shrinkage values than those dried at the high temperature and decreasing the sample size resulted in higher shrinkage at both temperatures. This is due to the large percentage of the cut area. However, the eighth had the lowest shrinkage among the cut samples at both temperatures. Shih et al  reported 50% shrinkage in dried strawberry and found long hot air drying time to cause more cells to collapse. Ketelaars et al. stated that shrinkage of food products during drying is attributed to moisture removal and the stress developed in the cell structure during the drying process. Since dried strawberry pieces are to be consumed as snacks or with breakfast cereals, a relatively low rehydration value is desirable in order to maintain their crunchiness. On the other hand, very low rehydration capacity indicates sever disruption of the strawberry structure [36,27]. Thus, more porous structure facilitates rapid rehydration. 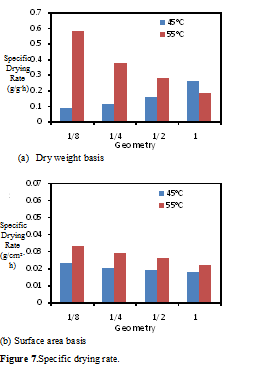 In this study the rehydration values varied from 15.23% to 27.82% (Figure 11) and was affected by both the drying temperature and the strawberry geometry. The higher the temperature and the larger the sample size the higher the rehydration value. The rehydration value was also related to the shrinkage of the samples that was caused by the removal of moisture, the higher the shrinkage the lower was the re-absorbance of water (Figure 12). Shrinkage must have disrupted the structure of the strawberry samples and affected their porosity which in turn affected the rehydration capacity of the dried strawberry samples. McMinn and Magee ( stated that the degree of rehydration depend on the degreeof cellularand structural disruption. Shih et al. reported that long heating periods during drying of food products resulted in irreversible physic-chemical changes. The initial moisture content for the fresh strawberry samples was 90.2%. Drying strawberry at the lower temperature (45°C) required longer drying time for all strawberry geometries and the whole strawberry required the longest drying time followed by the ½. ¼ and 1/8, respectively. Increasing the total surface area to the weight ratio and the cut area resulted in a faster decline in the moisture content over time. The critical drying time (time to reach 15% moisture content) was 22.1, 34.0, 45.2 and 56.2 h and 15.5, 24.0, 31.8 and 48.5 h for the whole, half, quarter and eighth at the temperature of 45 and 55oC, respectively. The specific drying time was 3.40, 5.55, 8.11 and 10.34 h/g strawberry and 2.94, 3.91, 5.77 and 7.25 h/g strawberry for the whole, half, quarter and eighth at the 45 and 55 oC, respectively. The average drying rate was 0.26, 0.16, 0.11 and 0.09 g moisture/h and 0.31, 0.23, 0.16 and 0.12 g moisture/h for the whole, half, quarter and eighth at the temperatures of 45oC and 55oC, respectively. The specific drying rate on weight basis was 0.016, 0.021, 0.029 and 0.042 g moisture/ g dry matter. h and 0.019, 0.030, 0.039 and0.053 g moisture/ g dry matter. h for the whole, half, quarter and eighth at the temperatures of 45oC and 55oC, respectively. The specific drying rate on surface area basis was 0.018, 0.019, 0.020 and 0.023 g moisture/ cm2. h and 0.022, 0.026, 0.029 and0.033 g moisture/ cm2. h for the whole, half, quarter and eighth at the temperatures of 45oC and 55oC, respectively. The lightness of the dried strawberry sample was lower than that of fresh samples. The results showed that the redness of the dried strawberry samples was stronger (darker red color) than that of fresh samples as a result of increased concentration of the red pigments and the non-enzymatic browning reaction caused by the drying temperature.No significant differences were observed in the degree of yellowness between the fresh and dried strawberry samples.. The total color change (∆E) decreased with increased temperature and increased with decreased sample size. The hardness value varied from 3.86 N to 6.02 N and from 4.42 N to 6.82 N for the samples dried at the temperatures of 45oC and 55oC, respectively. The lower the temperature and/or the larger the sample size the softer the dried strawberry. Shrinkage was evident in all dried strawberry samples and its extent was dependent on the temperature and sample size. It varied from 21.71% to58.86% and from 44.57% to 63.77%for the samples dried at the temperatures of 45oC and 55oC, respectively. The rehydration values varied from 15.23% to 27.82% and was affected by both the drying temperature and the strawberry geometry. The higher the temperature and the larger the sample size the higher the rehydration value. The removal of moisture disrupted the structure of the strawberry samples andcaused shrinkage, the higher the shrinkage the lower was the re-absorbance of water. The project was funded by National Science and Engineering Council (NSERC) of Canada. The support of Dalhousie University and the Egyptian Food Technology Research Institute is highly appreciated. 1. FAO (2013) Statistical Database, Food and Agriculture Organization, Rome, Italy. 2. EMOA (2013) Annual Report of Higher Committee on Strawberries. Egyptian Ministry of Agriculture, Cairo, Egypt. 3. Abada KA, Mostafa MA, Dogheim SA (2005) Control of strawberry fruit by fungicides and determination of their residues in harvested fruits. Egyptian Journal of Phytopatholog 33:83-92. 4. TGMF (2014) The World's Healthiest Foods. The George Mateljan Foundation. 5. Aaby K, Skrede G, Wrolstad RE (2005) Phenolic composition and antioxidant activities in ﬂesh and achenes of strawberries (Fragariaananassa). Journal of Agricultural and Food Chemistry 53: 4032- 4040. 6. Meyers KJ, Watkins CB, Pritts MP, Liu RH (2003) Antioxidant and ant proliferative activities of strawberries. Journal of Agricultural and Food Chemistry 51: 6887- 6892. 7. Olsson ME, Andersson CS, Oredsson S, Berglund RH, Gustavsson K (2006) Antioxidant levels and inhibition of cancer cell proliferation in vitro by extracts from organically and conventionally cultivated strawberries. Journal of Agricultural and Food Chemistry 54: 1248 - 1255. 8. Aaby K, Ekeberg D, Skrede G(2007) Characterization of phenolic compounds in strawberry (Fragariaananassa) fruits by different HPLC detectors and contribution of individual compounds to total antioxidant capacity. Journal of Agricultural and Food Chemistry 55: 4395- 4406. 9. Verbeyst L, Oey L, Van der Plancken I, HendrickxM, Loey AV (2010) Kinetic study on the thermal and pressure degradation of anthocyanins in strawberries. Food Chemistry 123: 269- 274. 10. Cos P, Bruyne TD, Hermans N, Apers S, Berghe DV, et al. (2003) Pranthocyanidins in health care: Current and new trends. Current Medical Chemistry 11: 1345-1359. 11. Määttä-Riihinen KR, Kamal-Eldin A, Tӧrrӧnen AR (2004) Identiﬁcation and quantiﬁcation of phenolic compounds in berries of Fragaria and Rubusspecies (family Rosaceae). Journal of Agricultural and Food Chemistry 52: 6178- 6187. 12. Klopotek Y, Otto K, Boehm V (2005) Processing strawberries to different products alters contents of vitamin C, total phenolics, total anthocyanins and antioxidant capacity. Journal of Agricultural and Food Chemistry 53: 5640-5646. 13. Seeram NP, Lee R, Scheuller HS, Heber D (2006) Identiﬁcation of phenolic compounds in strawberries by liquid chromatography electrospray ionization mass spectroscopy. Food Chemistry 97: 1-11. 14. Heneman K, Zidenberg-Cherr S (2008) Some facts about catechins. Nutrition and Health Info-sheet, UC Cooperative Extension Center for Health and Nutrition, University of California Davis, California. 16. Parker T (2009) Post your heart and fight disease with Pelargonium. Health, Fitness and Nutrition. 17. Wang D (2011) Cyanidin health benefits: A research study on cancer, diabetes and arthritis. 18. 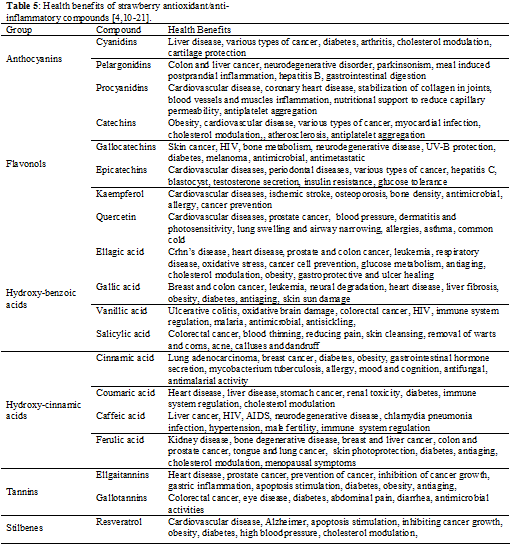 Nortonn KJ (2012) Phytochemicals in foods: 13 health benefits of gallocatechin. Health Articles. 19. Schroeter H, Heiss C, Dalzer J, Hollenberg NK, Sies H, et al. (2012) Epicatechine mediated beneficial effects of flavonal-rich cocoa on vascular functions in humans. Proceedings of the National Academy of Science of USA. 20. Richards BJ (2013) Quercetin for nerves, allergies, immunity and metabolism. Health News. 21. Frank K (2015) Cyanidin health benefits: A research study on cancer, diabetes and arthritis. Scientific Research Citation. 22. 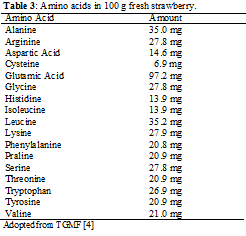 Hannum SM (2004) Potential impact of strawberries on human health: a review of the science. Critical Reviews in Food Science and Nutrition, 44: 1- 17. 23. Zhang BM, Xiao G, Salokhe VM (2006) Preservation of strawberries by modiﬁed atmosphere packages with other treatments. Packaging Technology and Science 19: 183-191. 24. Gunders D (2012) Wasted: How America is losing 40 percent of its food from farm to fork to landfill. Report No. IP-12-06-B, National Resource Defense Council, Washington, DC. 25. Evans SD,Brambilla A, Lane DM,Torreggiani D, Hall LD (2002) Magnetic resonance imaging of strawberry (Fragariavesca) slices during osmotic dehydration and air drying. Journal LebensmittelWissenschaft Und Technollgie, 35:177-184. 26. Askari GR, Emam-Djomeh Z, Mousavi SM (2006) Effects of combined coating and microwave assisted hot-air drying on the texture, microstructure and rehydration characteristics of apple slices. Journal Food Science and Technology International 12:39-46. 27. Jayaraman KS, Das Gupta DK, Mujumdar AS (1995) Handbook of Industrial Drying. CRC Press, New York. 28. El-Beltagy A, Gamea GR, Amer-Essa AH(2006) Solar drying characteristics of strawberry. Journal Food Engineering 78: 456–464. 29. 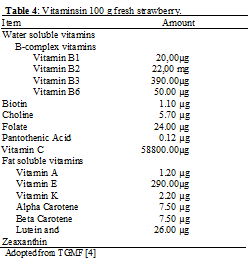 Giampieri F, Tulipani S, Alvarez-Suarez JM, Quiles JE, Mezzetti B, Battino M (2012) The strawberry: Composition, nutritional quality, and impact on human health. Journal Science Direct 28: 9-19. 30. Krokida MK, Karathanos VT, Marouils ZB, Marnos-Kouris M (2003) Drying kinetics of some vegetables. Journal of Food Engineering 59:391-403. 31. Brooks MS, Abou El-Hana NH, Ghaly AE (2008) Effects of tomato geometries and temperature on the drying behavior of plum tomato. American Journal of Applied Science 5:1369-1375. 32. Zanoni B, Peri C, Nani R, Lavelli V (1999) Oxidative heat damage of tomato halves as affected by drying. Food Research International 31: 395-401. 33. Singh B, Panesar PS, Nanda V, Bera MS (2008) Optimization of osmatic dehydration process of carrot cubes in sodium chloride solution. International Journal of Food Engineering 4:1-22. 34. Mahn AV, Antoine P, Reyes A (2011) Optimization of drying kinetics and quality parameters of broccoli florets. International Journal of Food Engineering 7: 1-14. 35. Pandey DK, Verma RC, Chahar VK (2008) Effect of pretreatment on drying of papaya cubes. International journal of Food Engineering 4: 1-11. 36. Shih C, Pan Z, McHugh T, Wood D, Hirschberg E (2008) Sequential infrared radiation and freeze drying methods for producing crispy strawberry. Transaction of the ASABE 51:205-216. 37. Li G, Ma Z (2003) Vacuum freeze drying process of strawberry. Food and Machinery 3:18-19. 38. Hammami C, Rene F (1997) Determination of freeze drying process variables of strawberry. Journal of Food Engineering 23: 133-154. 39. Xiao H, Lin H, Yao X, Du Z, Lou A, et al. (2009) Effect of different pretreatments on drying kinetics and quality of sweet potato bars undergoing air impingement drying. International Journal of Food Engineering 5:1-17. 40. Orak HH, Aktas T, Yagar H, Isbilir SS, Ekinci N (2015) Effect of hot air and freeze drying methods on antioxidant activity, color and some nutritional characteristics of strawberry tree (Arbutus unedo L) fruit. Journal of Food Science and Technology International 18:391-402. 41. 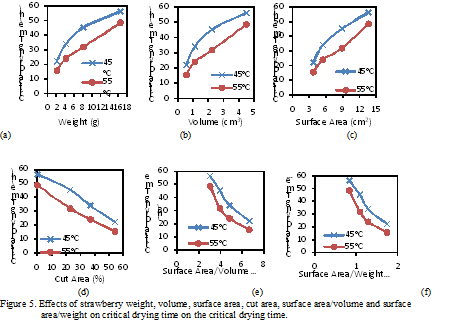 Jamradloedluk J, Nathakaranakule A, Soponronnari S, Prachayawarakom S (2007) Influences of drying medium and temperature on drying kinetics and quality attributes of durian chip. Journal of Food Engineering 78:198-205. 42. Baysal T, Icier F, Ersus S, Yildiz H (2003) Effect of microwave infrared drying on the quality of carrot and garlic. European Food Research and Technology 218:68-73. 43. Orikasa T, Wu L, Ando Y, Muramatsu Y, Roy P, et al. (2010) Hot air drying of sweet potato using moisture sorption isotherm analysis and its quality change during drying. International Journal of Food Engineering 6: 1-14. 44. Chong CH, Law CL, Cloke M, Hii CC, Abdullah CC, et al. (2008) Drying kinetics and product quality of dried chempedak. Journal of Food Engineering 86:522-527. 45. Leeratanarak N, Devchastin S, Chiewchet N (2006) Drying kinetics and quality of potato chips under different drying techniques. Journal of Food Engineering 77:636-643. 46. Ketelaars A, Jomaa W, Puigalli J, Coumnas W (1992) Drying shrinkage and stress. Elsevier, The Netherland. 47. Doymaz I (2007) Air drying characteristics of tomatoes. Journal of Food Engineering 78:1291-1297. 48. 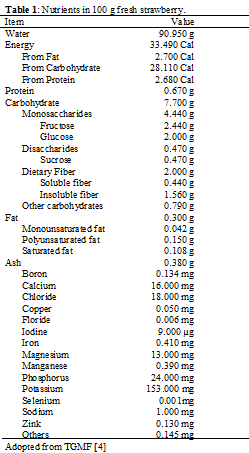 McMinn W, Magee T (1997) Physical characteristics of dehydrated potatoes. Journal of Food Engineering, 33: 49-55.